In this installment of the Golden Age of Comic Books we cover The Spectre from DC Comics! This supernatural character made his first appearance in the pages of More Fun Comics #52 (February 1940) as written by Jerry Siegel and drawn by Bernard Bailey. The Spectre was a big hit for DC, and he went on to star with the Justice Society of America in the pages of All-Star Comics. 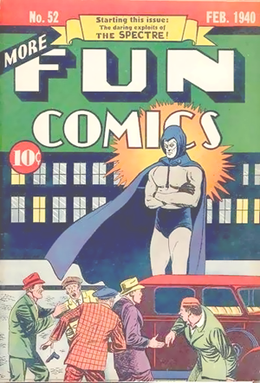 His last Golden Age solo adventure was in More Fun Comics #101 (1945) and with the JSA in the pages of All-Star Comics with issue #23 (1945). The Spectre was revived in the Silver Age of Comics and remains a popular DC Comics superhero. This entry was posted in Golden Age Comics, Podcast and tagged All-Star Comics Society of America, DC Comics, Justice Society of America, More Fun Comics, Spectre. Bookmark the permalink.